Marinate your chicken in the Stubb's Chicken Marinade for at least 1-2 hours or overnight. Grill until the chicken is thoroughly cooked through, slice and set aside. Cook the soba noodles according to package directions (usually only 4-5 minutes), rinse, drain well and set aside. Combine the sesame oil, soy sauce, brown rice vinegar and brown sugar in a medium bowl and whisk together. Pour the soy sauce mixture over the soba noodles and mix to combine and coat the noodles. I prefer using disposable plastic gloves so I can mix with my hands. 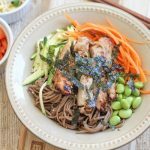 To serve: portion out the soba noodles into serving bowls, place the julienned carrots and zucchini and shelled edamame around the noodles and top with slices of the cooked chicken. Lightly drizzle more sesame oil and soy sauce over the top if desired. Top with dried seaweed and sesame seeds. Serve and enjoy immediately.